Moving abroad is becoming a popular choice for people in retirement. 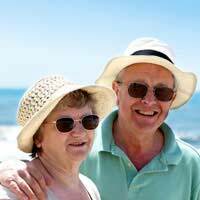 Many people in retirement are choosing to swap the soggy damp shores of the UK for an all year round sunny climate. John and Margaret were both in their 60s and had lived all their lives in the UK, but now they were reaching retirement and wanted to put their feet up, relax and soak up some sun in another country. They had holidayed for a number of years in the Algarve and had always fancied the idea of moving there permanently. Before the move John and Margaret were concerned about what they would do with their property. If they sold it they would not have anywhere to live if they decided to return to the UK. “We thought about renting our property out, but did not like the idea of strangers in our home. Our son however was in his late twenties and trying to get a foot on the housing ladder, but not having much luck. We offered to let him live in our home in the UK and pay us a weekly rent,” says John. “The Algarve is great in your 60s, but we were not 100% sure we would still want to be there when we reached our 80s,” explains John. John and Margaret opted to buy a two-bedroom apartment in the Algarve equipped with a shared pool and sea view. “We had been saving our money for a while and an apartment out there was not as expensive as in the UK, so a small apartment was not out of our reach. “We contacted a UK based firm that specialised in properties abroad before we left and they organised a number of viewings for us while in the Algarve. It didn’t take long for us to find our dream retirement home,” explains John. “Our main concern was whether our state pension would still be valid if we moved to Spain. I had a company pension, but we knew we would not be able to get by comfortably without our UK state pension,” says John. “This turned out not to be a problem, we looked into it and were told that because we had reached state pension age we would still receive our full pension. This could have been different if we had opted to move to a country such as Australia or Canada, as the government would have frozen our pension at the rate it was when we left and it would have risen with inflation,“ explains John. One of the main worries people have about drawing out their pension when living abroad is over exchange rates. If the pound goes down in value then it can mean you miss out on a hefty chunk of your pension, as it will be converted into euros, if you are in a European country. Just because you are living abroad it does not mean you are not entitled to claim the same benefits as those living in the UK. “Because we were in a European country we were also allowed to claim our Winter Fuel Allowance. Although we didn’t need this as much as if we had been in the UK, it was still a huge help,” explains John. “We had been claiming our Winter Fuel Allowance since we were 60 years old in the UK, if we had not been doing that we would not have been able to claim it while living abroad,” says John. “We are having the times of our lives in the Algarve, we are able to sit in the sun most days and escape all the problems we had back in the UK. We do miss our family, but they are able to come and visit and with flights being so cheap we can afford to go and visit them now and again,” says Margaret. Moving abroad in retirement is a great idea if you are looking for a bit of adventure in your old age. It is a big decision though so you should think very carefully before you decide to move there permanently. You should carry out thorough research of the area you are moving to and speak to some people in the area so you can gage what it is like to live there.